Every photographer knows that shooting lots of images helps to perfect their craft. The more you shoot the better you get at defining your vision. But there is also a technical aspect of photography and when it comes to that there is one thing that has helped me considerably in taking better photos. It’s something that I have overlooked for years. It’s actually taking the time to read the manual. I’m the first to admit that when it comes to user manuals I typically don’t read them. I prefer to just figure things out on my own. But the problem with that approach is you miss out on learning features you might not even be aware of. I know what you are thinking at this point. You’re wondering where your manual is. I thought the same thing. When I got my new camera and opened the box I set the manual aside and forgot all about it. Who has time to read the manual anyway? But for the past few months I’ve actually taken the time to read the manual cover to cover. Why? Because I realized that I want and need to know everything about the tools I use to make great photos. And what I found out as I read through the pages was that there were a lot of features that I wasn’t even aware of, features that I can actually use to take my photography to the next level. For example, on my camera (Canon 5D Mark II), I learned about the custom function settings like changing the exposure level increments from 1/3-stop to ½-stop increments (C.Fn I -1) or the ISO speed setting increments from 1/3-stop to 1-stop (C.Fn I -2). Ever been shooting with a telephoto lens in low light or situations where focus cannot be achieved and found it hunting for focus and becoming extremely out of focus? You can stop this behavior by setting the focus search to off (C.Fn III -1). I discovered that you can expand the AF point area while shooting in AI Servo to better deal with subjects that move erratically (C.Fn III -7). There are several menus that I use on a regular basis. By reading the manual I learned that I can register them in “My Menu” so I can access them more quickly. I can even sort them so the ones I use the most are at the top of the list. Finally I discovered what the C1, C2 and C3 positions are used for on my cameras mode dial. If you are wondering they allow you to register the current camera settings so you can use them again and again by changing the mode dial to one of those positions. 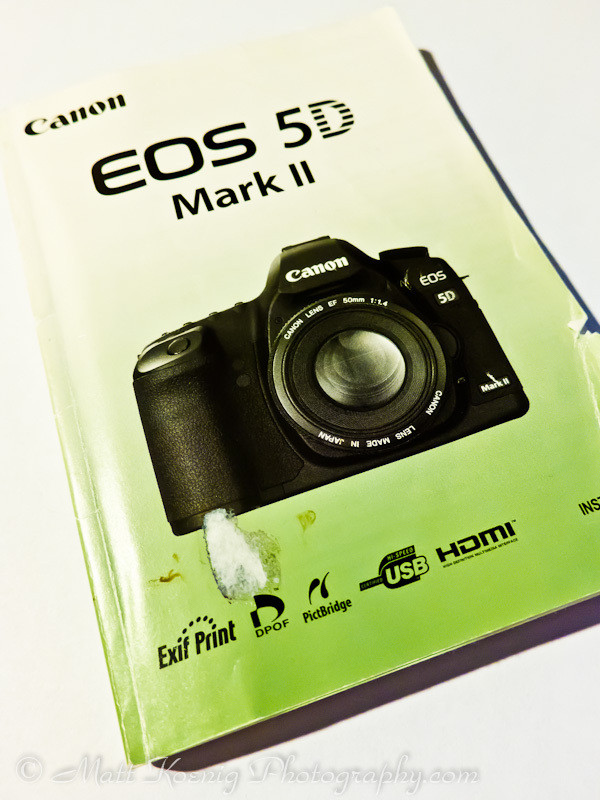 There is a wealth of information contained in your cameras manual. I used to think I was above reading the manual (or looking at a map when lost) but I now see the true value in actually going through the manual and learning everything I can about my camera. It’s been a good learning experience and helped me grow as a photographer and become more familiar and comfortable with the tools I use. So here is my challenge to you. Pick up the manual for your camera (it’s probably buried in a box labeled miscellaneous crap) and start reading through it. I think you will be as surprised as I was to discover new things about your camera.